The “Related Lists” editor determines which records from related lists will be restored for each record. 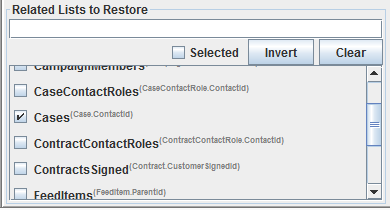 For example, when restoring Account the related lists Contacts, Cases, and Opportunities will usually be available. To restore a related list click on the check box next to the name. In the following screen shot the related list “Cases” was selected for the Contact table. 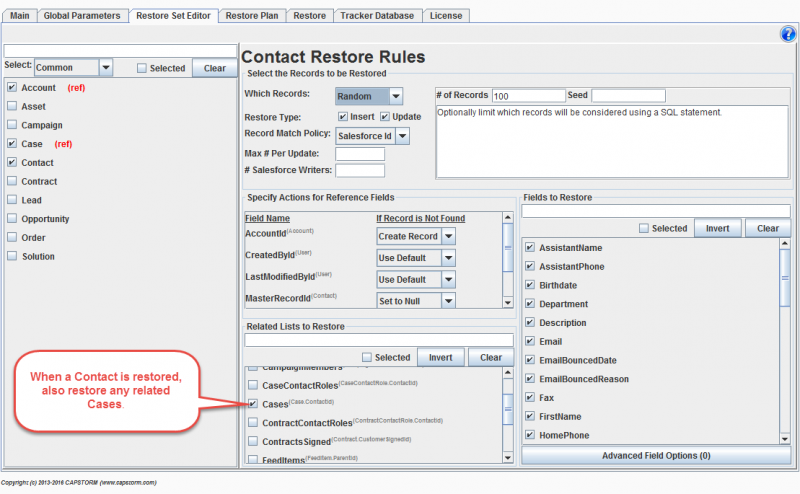 This will cause CopyStorm/Restore to restore all Cases related to selected Contact records. Note that the superscript on each related list indicates the SalesForce Table and Column associated with the list. Selecting a related list will automatically add the related table to the list of selected tables (if the table is not already a member). It will be added with the restore type of “Reference”, indicating that the records to restore are determined by other table rules.